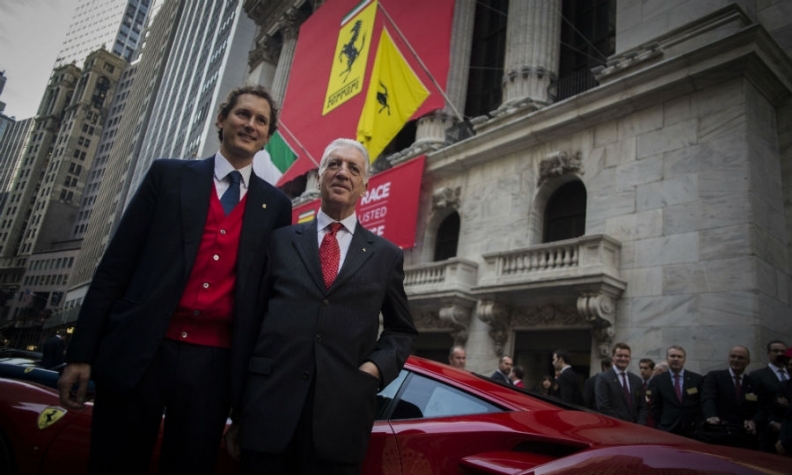 John Elkann, left, and Piero Ferrari outside of the New York Stock Exchange. Ferrari's IPO made Piero a billionaire. NEW YORK (Bloomberg) -- Now that Ferrari is a publicly traded company, two Italian auto dynasties plan a pact to make sure it stays that way. Piero Ferrari, the son of founder Enzo Ferrari, and the Agnelli family -- heirs of the founder of Fiat -- are poised to sign an agreement tightening their control over the supercar maker. Under the terms of the IPO, the two families can take advantage of rules that will give them almost half of Ferrari's voting rights, rendering any potential takeover virtually impossible. "We have an agreement among the families to protect our interests in Ferrari," Piero Ferrari said following the company's initial public offering Wednesday. "We have a very strong understanding." Ferrari, 70, who is vice chairman of the company, said he has no plan to sell his 10 percent holding. John Elkann, chairman of Fiat Chrysler Automobiles and head of the Agnelli family, said he expects to remain Ferrari's biggest shareholder. Exor, the Agnelli's holding company, will own about 23 percent of Ferrari after Fiat Chrysler spins off its 80 percent stake, probably in January. Under Ferrari's loyalty share plan, stock owners who pledge to retain their stake for at least three years receive special shares that increase their voting rights. That would give the two families control of 48.7 percent of the company, allowing them to fend off potential bidders. Fiat Chrysler last year adopted a similar scheme. "We definitely look forward to the great ride ahead," Elkann, 39, said on the floor of the New York Stock Exchange after a ceremony marking Ferrari's debut. Piero inherited his stake from Enzo, a racing driver for Alfa Romeo who founded the Scuderia Ferrari team in 1929. He produced his first racing car in 1947 then introduced a road car the following year. In 1950 Ferrari began to race in Formula One, and has since racked up 225 Grand Prix wins and 16 world championships, making it the sport's most successful team. Ferrari stock, which trades under the ticker RACE, climbed 6 percent in its first day of trading. The IPO valued the carmaker at about $12 billion including debt and made Piero Ferrari a billionaire, with a fortune of $1.4 billion -- mainly from his stake in the company -- according to the Bloomberg Billionaires Index. Though he is newly ranked as a billionaire his stake in the company "has always been there," Ferrari said. "I never planned to sell it and have no intention to do so now."